Evolution of the cafetière: 1930s Melior(UK) 6 cup, silver plate; 1950s Melior(UK) copper; 1960s Melior(France) first Chambord; 1970s La Cafetière Chambord gold finish; 1990s Bodum, Chambord. I used to be a design geek in the 1990s. I had to have objects that were original, so I bought a Bodum Chambord. The Conran Design Guide told me that it was 'a faithful reproduction' of the original design from 1933 by 'an Italian called Calimani'. In spite of its entry in the Conran Design Guide, the Chambord looks little like cafetières from the 1930s. The first successful cafetière style coffee maker was the Melior coffee pot (below, right). My Bodum Chambord shares some ancestry with it and can make some claim to be the original cafetière. But the story is more complicated and yes, an Italian called Calimani is part of it. To the French a cafetière is any kind of coffee pot. What we think of as a cafetière is a 'cafetière à piston' in France. There is a story about an old man from Provence who first thought of the idea behind the cafetière. He took a walk each day to escape his nagging wife taking with him a pot and some coffee. He found a spot to boil the water and make the coffee. As was the custom of the time, he made his coffee by putting the ground coffee into the water and boiling it. The ground coffee sank to the bottom and he poured the coffee into the cup. One day he forgot to add the coffee and boiled the water first. When he added the ground coffee to the water, it floated on the top, making it undrinkable. A passing merchant sold him some gauze to filter the coffee. Was this the birth of the modern cafetière? Unfortunately, I could find no way to verify the story. I can verify that Henri-Otto Mayer and Jacques-Victor Delforge filed the first patent for a cafetière-like device on 27 March 1852. However, there is no evidence that the device worked, or that they sold any of them. Another Frenchman, Louis Forest, made the first commercially successful device that looked like a cafetière - the Cafeolette. He launched it on 1 November 1913. It could be purchased in the famous Paris department stores, Bon Marché and Printemps. The Cafeolette was a small pot with a piston-type metal filter with small holes in it. It made café au lait (coffee with milk). You put your coffee in the Cafeolette, then boiled the milk in a saucepan and poured it into the Cafeolette. You left it to brew for three minutes and then pushed the filter down. Since the filter was just a metal disc, it may not have been good at removing the coffee grounds. It also made coffee with milk, so it was not a cafetière as we understand it. This is where Calimani comes in. Attilio Calimani and Giulio Monet filed two patents in 1928 and 1933 that describe a workable modern cafetière. The second of these patents described a deformable luting member (luting means to seal or join) which acted as a spring to hold the filter in place and stop the ground coffee escaping. This was the breakthrough that made the modern cafetière; though Calimani and Monet designed the mechanism, not the coffee maker itself. A French business, called Melior, which made kitchen equipment, took up Calimani's and Monet's idea. Melior then launched the first successful cafetière, the Melior Coffee Pot. They sold small quantities in France and in the UK. 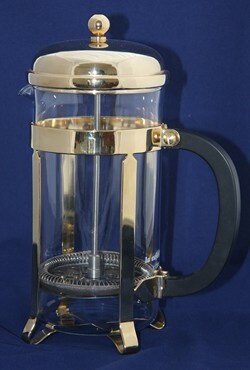 Melior established a business in the UK, Melior Products Limited, which made a UK version of the Melior Coffee Pot. The filter was Calimani's and Monet's design - a metal disk with holes in with a wire mesh above it. The pot was silver plated. One of its benefits of the design was that it made it easier to make coffee. According to the Army & Navy Stores Catalogue (1935), which distrubuted it in the UK, it made coffee as easy as to make as tea. People were used to making tea, but thought coffee was difficult to make. The Melior Coffee Pot solved the problem for them. But it was not cheap. The Army & Navy Stores sold it in three sizes: four, six and eight cups for 14/6, 17/6 and 21s respectively [£35, £42 and £51 in today's money]. There was also a six cup version in 'finest quality silver plate' for £1 19s 6d [£95 in today's money]. As the average wage was only £2 per week, these coffee pots were only for the better off. By 1937 Melior sharpened up the design. It was now classically simple, with an elegant Bakelite art deco handle and finished in silver plate. It would have looked good on any upper-middle class dining table. There was also a ceramic range in green, brown, blue mist, cream and gold. One small but significant improvement was patent 448883 filed on 17 June 1936 by another Italian, Gemma Barelli Moneta. It was for a spring which fitted around a metal disk that sat above the filter. This spring provided a much better seal than the previous luting method and essentially completed the design of the modern cafetière. However, UK-made Meliors still used the original style of filter, at least until the start of the Second World War. There was still no sign of the Chambord design. So when was the 'Chambord' design introduced? Although it looks like it might have come from the early twentieth century, the 'Chambord' design is a product of the 1960s. In the early 1950s the French Melior Company made a cafetière à piston with a glass rather than a metal container and the new method of sealing the filter flush against the container. In 1959, they started to use the term 'Chambord', possibly a reference to the roofline of Château de Chambord. The design evolved to resemble today's Chambord design by the late 1960s. When did the 'Chambord' cafetière first sell in the UK? 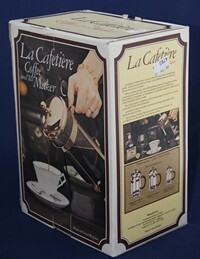 Upmarket packaging for 1970s La cafetière. You could always buy the French-made Chambord in the UK. Fortum & Mason sold them for £3 2s 7d (£45 in today's money) in 1962. However, there was soon a UK-made version. The principal investor and manager of Martin SA, which owned the Melior brand in France, was Louis-James de Viel Castel. He also owned the UK company, Household Articles Limited. In 1969 Household Articles Limited started making and selling the Chambord design in the UK. The new coffee maker, called 'La cafetière', was made at Household's manufacturing plant in Greenfield near Holywell in Clywd, North Wales. 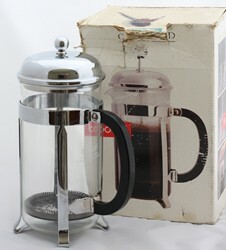 It was this product which introduced the UK to the term 'cafetière' meaning a piston type coffee pot. Household's Sales Director, Keith Ireland, positioined the La cafetière at the top of the market. He placed adverts in Country Life and sold it to top department stores John Lewis, Harrods, Fortum & Mason and Selfridges. The cafetière method was still unfamiliar in the UK in the early 1970s. Ireland's adverts stressed the similarity of the cafetière method to making tea in a pot. He also played on the continental sophistication of the cafetière, 'make coffee the way the French do'. He also hedged his bets by suggesting it also made tea. La cafetière was expensive. It sold for £6 15s for a standard chrome plated coffee pot, or £9 12s for a gold plated one. These sums represent £70 or £100 in today's money. Although you could also smoke your way to a cafetière. Embassy offered them as gifts in their cigarette coupon catalogues in the early 1970s. The public still did not take to this method of making coffee. To get the best out of it you needed to coarsely grind the beans. Most people, if they did not only drink instant coffee, stuck with percolators or bought a filter coffee maker. Didn't Michael Caine use a cafetière in the 1965 film, The Ipcress File? The Ipcress File was a spy novel by Len Deighton which was made into a film in 1965. In the title sequence Michael Caine wakes up to the sound of his alarm clock. He gets up and boils a kettle. He then grinds a handful of coffee beans in an electric coffee grinder and puts the ground coffee in what looks like a cafetière. He then pours in the boiling water and plunges it immediately. The device he was using was an Insta Brewer made in the USA. The makers, Corning (famous for Pyrex), advertised the Insta Brewer as a method of making real coffee as quickly as instant. The Insta Brewer was a cafetière used incorrectly to make coffee tasting no better than instant. It had one important difference. There was a spring at the top of the spindle and Michael Caine pushed it home to squeeze the ground coffee now at the bottom of the beaker. When did cafetières become popular in the UK? Cafetières remained a minority product in the UK until the 1990s. One measure of popularity was when did Argos start selling it? Amazingly not until 1990, when an eight cup La cafetière cost £38.50 [£70 in today's money]. So what about the Bodum Chambord? 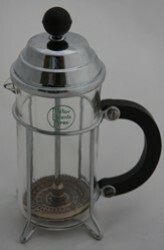 In 1991 Bodum bought Martin SA, the manufacturer of the French Melior cafetière. 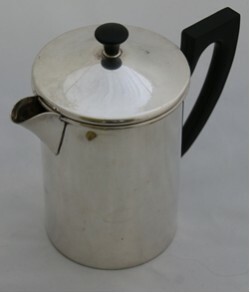 Household Articles still sold the UK version called 'La cafetière'. Bodum sold the Melior Chambord as the Bodum Chambord from 1991 in the UK and in Europe, competing in the UK with 'La cafetière'. So the Bodum cafetière can claim to be the successor to the French Melior Chambord. Conran Design Guides: Kitchenware, by Jeremy Myerson and Sylvia Katz, pubished Conran Octopus, 1990 page 60. La Rire, 1 November 1913. GB308993 - Improvements in coffee pots and GB395548 - Apparatus for the preparation and quick filtration of infusions and especially coffee.